Infographic: October is National Cybersecurity Awareness Month! Infographic: Do You Have the Skills of a Fortune 100 CISO? As your organization’s dependence on technology grows, the role of the Chief Information Security Officer (CISO) is more important than ever. What does it take to work at the executive-level in cybersecurity? Varonis analyzed data from the CISOs of Fortune 100 companies to get a better sense of what skills these leaders possessed. Smart devices are the new normal, and employees expect that their mobility will carry into the workplace. Having a well-planned, flexible BYOD policy in place is more important than ever. Check out some of the challenges to BYOD programs in this infographic from submitinfographics.com. 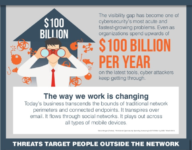 As this infographic from Proofpoint demonstrates, there’s a huge cybersecurity visibility gap—and you may not be seeing the biggest threats. View the original infographic here. Infographic: Is Your Organization Prepared for an Insider Threat?